So, I tried to make it to every rib booth at the Naperville Ribfest, but sadly I failed. I made it to less than half and was by then stuffed and exhausted. Naperville is a big place and by the time we got to Ribber Row, we had played games, sampled products, filled out contest entry forms, danced, threw beanbags and took lots of photos. As I strolled by Texas Outlaws, I caught a glimpse of these big, meaty slabs of ribs on a grill and stopped to snap a couple pictures and chat with owner Jim Clayton, who is not only a rib master on the road, but also has a 220-seat restaurant in Elizabethown, Kentucky. Among their specialties are ribs, beef brisket, pulled pork, pulled chicken, BBQ beans, cole slaw and mac and cheese. 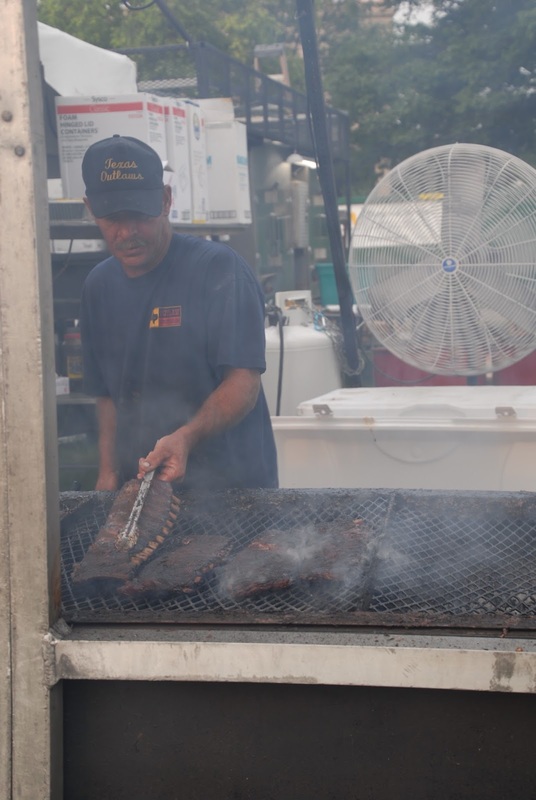 Clayton said that they were the only 4-time winner at the Naperville Ribfest. As all the booths do, banners hang around the serving area advertising all the awards they have amassed and there have been plenty for Texas Outlaws. Some have been for their sauces, of which there are two varieties: Honey BBQ and Bold and Spicy.